In 2017, the Detroit Lions had arguably one of the worst defensive lines in the entire NFL. As a unit that season, Detroit’s defensive line earned a 68.1 overall grade, which ranked 30th out of all 32 teams; they struggled as a unit both in run defense (63.9 run-defense grade that ranked 30th among teams) and when it came to rushing the passer (64.8 pass-rush grade ranked 25th). Among Detroit’s defensive front in 2017, not a single player finished the year with an overall grade of at least 80.0, and just three members of the unit finished the season north of 70.0, with Ezekiel Ansah leading the way with his 72.7 overall grade. Meanwhile, the Lions had six players on their defensive line finish the season with at least 100 defensive snaps played and an overall grade below 65.0. 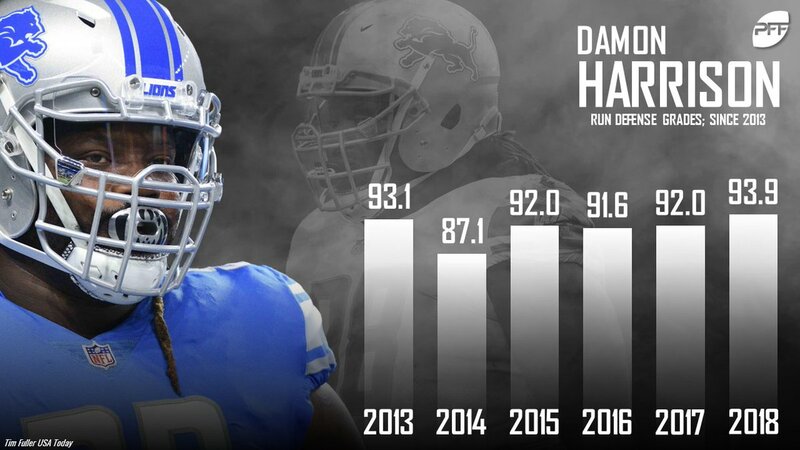 Fast forward to the present, and Detroit’s defensive line might be one of the most improved units in all of football since the 2017 season ended. The Lions’ defensive line finished 2018 ranked 10th among NFL teams with an 84.8 overall grade and, although they didn’t improve much when it came to rushing the passer, they transformed into one of the premier run-stuffing defensive lines in the league, earning an elite 90.6 run-defense grade that was good for second-best among all NFL teams. In 2017, Detroit’s defensive line ranked 27th in the league by earning a run stop on just 25.8% of their run-defense snaps. This past season, that rate jumped up to 33.4% which was the fourth-best mark in the league, and they saw significant improvement when it came to stopping runs that came both inside and outside the tackles. On runs that went inside the tackles in 2017, the Lions’ defensive line ranked 23rd among teams in terms of both run-defense grade (73.4) and run-stop percentage (35.2 percent). In 2018, their run-defense grade jumped all the way up to 89.9 against runs between the tackles, and their run-stop percentage shot up to 42.8 percent, both ranking third in the league. On runs that went outside the tackles in 2017, the Lions’ defensive line ranked 31st among teams with a 53.9 run-defense grade, and they ranked 28th with just an 18.5% run-stop percentage. In 2018, their run-defense grade jumped up to 83.1 (fifth-best among defensive lines), their run-stop percentage jumped up to 23.5 percent (12th), and the Lions D-line also ranked second-best within the league last season with just a 6.5% missed tackle rate on those runs. Heading into the 2018 season, Detroit’s defensive line was considered a weakness, but by the end of the season that perceived weakness had turned itself into a strength. 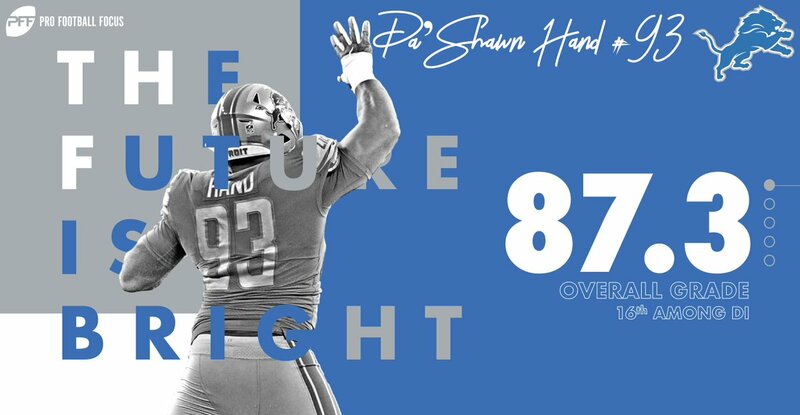 Ziggy Ansah continued to be an effective player – when he was on the field at least – and got his overall defensive grade back up to 81.6 for the season; A’Shawn Robinson took another step in his development and played at an elite level as a third-year player, finishing the season at 90.8 overall; Da’Shawn Hand played at an extremely high level as a fourth-round rookie, completing his first NFL season at 87.9 overall, and the Lions made a savvy trade mid-season to pick up Damon Harrison, one of the best run stoppers the NFL has ever seen, who finished his year at 91.9 overall to go with a league-leading 93.7 run-defense grade. While Ansah is currently a free agent, Robinson, Hand, and Snacks are all back in the fold for Detroit for 2019, where they’ll likely once again be a thorn in the side of opposing running backs.